2-2-2 This was a period when the railroads needed laborers to build and maintain the railways and sent (enganchistas) recruiters to the Mexican border ports to recruit men. My dad and two companions walked from Aranda, Jalisco up to El Paso where as they crossed the international bridge an enganchista persuaded them to work for the Rock Island Railroad. He locked them in a shed down at the railroad yards in El Paso to prevent other recruiters from stealing them away. The next day they were shipped in box cars to Montpelier, IA near Muscatine to work as section hands. During this long trip my father remembered they were fed bologna and pork and beans. He developed a life-time dislike for pork and beans. In 1910 there was no need to have an immigrant visa to enter the U.S. from Mexico. 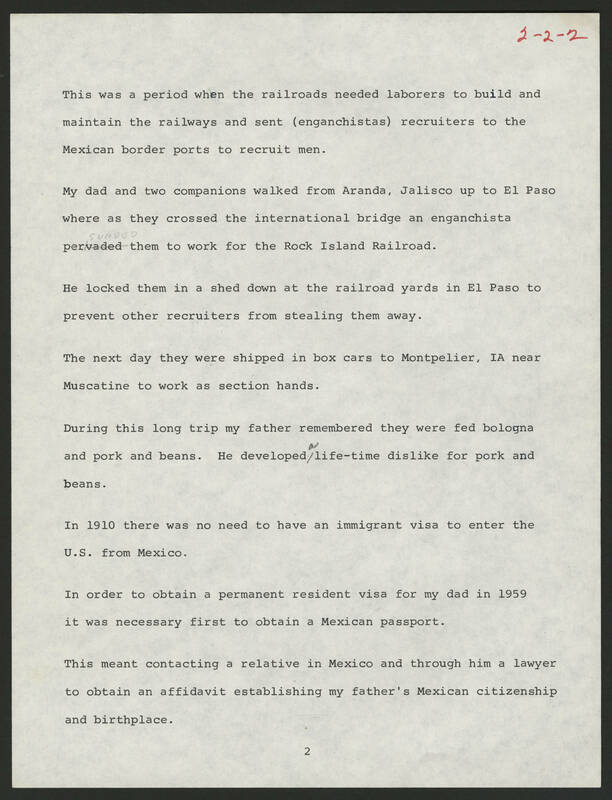 In order to obtain a permanent resident visa for my dad in 1959 it was necessary first to obtain a Mexican passport. This meant contacting a relative in Mexico through him a lawyer to obtain an affidavit establishing my father's Mexican citizenship and birthplace.